Most sales reps will tell you the window they sell has a Lifetime Warranty. It’s true. Most of the replacement windows sold in the Tampa Bay market do come with lifetime warranties. What most sales people neglect to tell you is that these warranties are Limited. Your replacement windows will come with a lifetime limited warranty. Those limits should be a major part of your investigation when buying replacement windows in Tampa Bay- or anywhere for that matter. But here in Florida our harsh climate makes it even more important than other parts of the US. Let’s talk about cars. If your new car warranty covers you bumper to bumper for 36,000 miles, that means you are likely to have repair needs after 36,000 miles, right? If the manufacturer knew that their product would be trouble free for 50,000 they’d give you a 50,000 mile warranty. If they thought it would last for 100,000 miles, that’s what they’d cover. Warranties for the cars you buy tell you what the manufacturer is confident will last. Replacement window warranties work the same way. Look at their limits and you will see what the manufacturer thinks could fail. If they cover things that could fail it could cost them big money, and maybe drive them out of business. More than once I’ve seen successful companies who operate in the northern states come into Florida and fail, leaving their customers with miserable experiences, failing products without manufacturing support, and no other choice but to replace what they already paid dearly to replace before. I was General Manager of one of those who came into Florida with a 50 year replacement window warranty and then, four years later, just left. They didn’t have a replacement window that could handle our climate. Think about it. Does it make sense that a window that performs perfectly in Minnesota will do just as well in Florida? Our Florida environment has 4 things that your new replacement windows will have to deal with, and if they don’t, you could be doomed to replace your windows more than once. The worst home improvement is the one you have to pay for twice! 1) The Sun: Your new replacement windows must handle the sun. If you’ve ever lived up north, even in Georgia or any other southern state, you probably already know that the Florida sun is much more intense. It eats away at all things man made. Even reflected sunlight can take its toll. The same sunlight that destroys painted finishes and causes plastic to crack is going to go after your replacement windows. Check the replacement window warranties- not the one the window dealer gives you, but the warranty directly from the manufacturer. See what limits they include because of their fear that the sun will beat up their product over time. Do they say that weathering is normal? Do they point out that replacement parts they provide might not match the windows you bought? 2) Heat: Florida gets hot, real hot, and stays that way most of the year. Have you ever spent the day outside and found yourself to be drained of all energy because of the heat? Sure. Your windows are going to be dealing with that heat forever- hot on the outside and cool on the inside if they insulate well. What do you think that would be like? Have you ever walked barefoot on the sand near mid-day in the summer and actually burned your feet? What if the sun is directly shining on your west, south, and eastern exposed windows and in addition those windows are getting reflected light off of their surroundings? Watch for manufacturer’s replacement window warranties that don’t cover stress resulting from localized heat. I know. You are thinking it would be ridiculous for a replacement window warranty to exclude stress resulting from localized heat, but that’s a very important “out” for a manufacturer who doesn’t have a window designed specifically for the Florida climate. Beware! 3) Moisture: Your replacement windows must not only deal with wind driven rain, but humidity that rarely drops below 70%. Moisture kills wood windows. It accelerates weathering and aging in all windows. It sits and offers mold a perfect place to grow if your replacement windows don’t drain properly. Moisture helps the sun kill the finish and ages the window, to say nothing of the accelerating the potential for seal failure, the number one most devastating potential double pane window problem. Have you ever seen a window that looks foggy because moisture has seeped in between the glass? That’s seal failure. Check the replacement window warranties that come from the manufacturer to see what exclusions might be included regarding seal failure and wind driven rain events. You will find problems with replacement window warranties there too. 4) Wind: Your replacement window warranties will all exclude Acts of God like hurricanes and tornadoes. Your Homeowner’s Insurance Policy will take care of damage from them. But what is in high winds can be a problem on a regular basis, and the two worst are salt in the air and small particles, like tiny grains of sand. These can damage the frames and etch the glass. Manufacturers who know their windows are not made to deal with these elements will not cover normal weathering. Through other articles on this site I will go into greater detail in most of these issues. The most important thing here is to understand that you need to refer to the actual Manufacturer’s Warranty. Replacement window warranties from dealers, middle-men, are often exaggerated. They may tell you that they will cover labor for a lifetime when in fact the manufacturer does not. They may just be telling you what you want to hear. If they actually do provide full coverage, this will be a major source of loss for that dealer. The more products they sell and install, the more warranty issues they will face. The more they cover the labor costs, the more money they lose. The more money they lose, the closer they come to closing their doors. That exact situation happened to me. There came a point when the costs my small company incurred providing the parts and labor that the manufacturers who I represented did not cover was so great I was forced to close. Now all those people have to rely on the actual Manufacturer’s Warranty, with all the limits and exceptions. 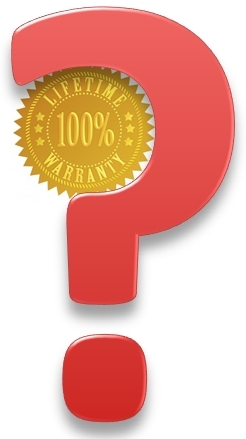 Look at the actual Manufacturer’s Warranty and ask yourself, “Can I live with that?” Realize- you may have to!